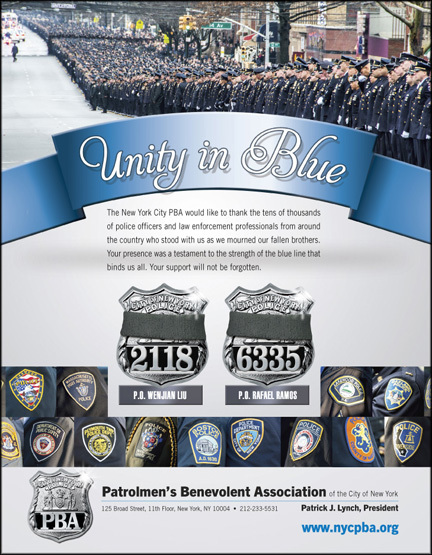 The PBA of New York City, the union representing 24,000 NYPD officers, is running the message below in the March issue of American Police Beat. 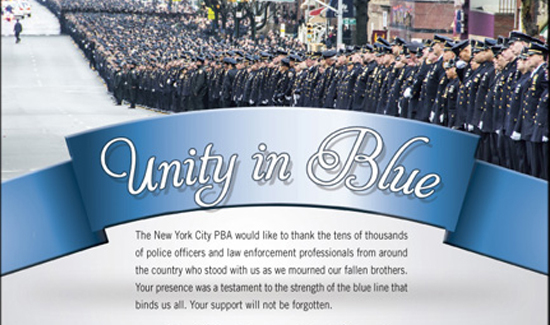 The message is a moving, heartfelt thank you to all their brothers and sisters in law enforcement—from the U.S., Canada and around the world—who came to New York City to attend the funerals of Rafael Ramos and Wenjian Liu, the officers who were gunned down as they sat in their patrol car in Brooklyn right before Christmas. Over 30,000 law enforcement officers came from everywhere to attend. It was the largest gathering of people in the profession in history, and everyone at the NYPD was very grateful for the outpouring of support.